16oz. Bell Mugs (Bright Red outside, White inside). A unique style of mug with a wider base and elegance handle. 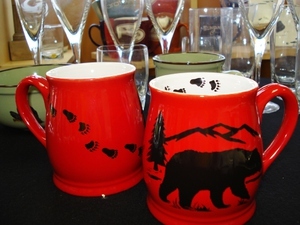 Each mug is decorated by hand with the Black Bear and Mountain Silhouette and enhanced with tracks on the inside lip and on the back of the mug.